What Does a C-Shaped Pregnancy Pillow do? Do I Really Need a Pregnancy Pillow? Are you pregnant and struggling to get a decent night of sleep? 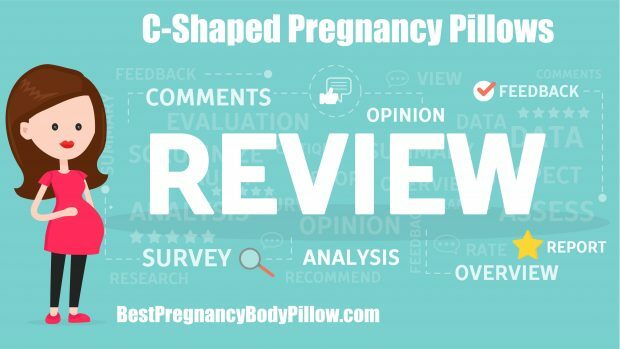 Check out this post to learn why a c-shaped pregnancy pillow might be right for you! Pregnancy can be a trying time for anyone. Hormonal changes make everyday tasks seem insurmountable from day one, and even the best sleepers may suddenly find that they are no longer comfortable at night. Between heat flashes, painful joints, heartburn, and a growing belly, pregnant women can be hard pressed to find relief. Luckily, pregnancy pillows can help any pregnant woman get a better night’s sleep, by positioning her body in a natural and safe way. While there are many types of pregnancy pillows and wedges, c-shaped pregnancy pillows might be the perfect choice for you! During early pregnancy, your body has already begun to produce a great blood volume, and your body temperature has risen a degree or two. Hormones that help relax joints and muscles are in production, and at the same time, your brain is in overdrive. It can be nearly impossible to find a comfortable position to sleep in! It might be even harder if you are facing morning sickness or sore and tender breasts. Pregnancy pillows are designed to cradle and comfort your body from every angle. While a regular body pillow may help you get into a specific position, only a pregnancy pillow can help you hold a safe and comfortable position throughout the night. If you find that you are having trouble sleeping in any trimester, then a c-shaped pregnancy pillow may be the answer to your problems. A c-shaped pregnancy pillow is specially designed for a growing pregnant body. The upper curve of the “C” is used as a neck and head pillow, while the lower curve helps to keep your hips and knees aligned. You position the C-shaped pillow around your body, so that it is close to your belly all the way down. By hugging this pillow close to your body, you are able to support your entire belly throughout the night. Heartburn is a common complaint during all trimesters of pregnancy. Women often experience the painful burning sensation for the first time when pregnant, and wonder what exactly they can do to stop the feeling. After dietary changes, your next step is to change the way you sleep. Sleeping flat can exacerbate the issue. Luckily, with a c-shaped pregnancy pillow you can easily contort the pillow to meet your needs. Just twist the upper curve of the pillow around to form a pocket, which can keep you in a restful upright position. Staying upright for a few hours after meals will help keep heartburn at bay. Another common issue that pregnant women face is joint pain. As the body produces prolactin, joints become loose in order to accommodate the growing baby. When you sleep, your hips, knees, spine, and shoulders are often out of alignment, making these aches and pains worse the next day. A c-shaped pregnancy pillow will allow you to keep your entire body aligned throughout the night. The gentle curves of the pillow keep your hips straight for side sleeping, and cradle your body if you are resting on your back. When using the moderate height of the neck portion of the pillow, your entire spine will be aligned and supported. For safety reasons, it is recommended that pregnant women sleep on their left side when possible. This is due to the way blood flows throughout the body and placenta. When laying on your back, oxygen-rich blood flow to the placenta can be cut off, slightly increasing the risk of stillbirth or other complications. However, it can be hard to maintain and side lying sleeping position when you aren’t used to it. That’s where the c-shaped pregnancy pillows comes in. Since it is able to cradle your entire body as you lay on your left side, you will have much less tossing and turning. You will likely be able to sleep through the night, cradled in your pillow as you enjoy the comforting support. A c-shaped pregnancy pillow is quite versatile beyond the third trimester. In fact, during pregnancy, it doesn’t have to just be used for sleep. You can use a pregnancy pillow to get comfortable on the couch for reading or watching television. After your baby is born, pregnancy pillows make wonderful nursing pillows. This takes away the need to buy an additional expensive piece of baby care equipment. Even those who aren’t pregnant or nursing may find a c-shaped pregnancy pillow useful. Athletes and those who are often sore from work may find that the aligning properties of the pillow are very helpful. Men and women with painful ailments such as arthritis or fibromyalgia may also want to invest in a pregnancy pillow. Anyone who has trouble sleeping may benefit from the support and positioning power of a c-shaped pregnancy pillow. Pregnant women are slammed with gear recommendations from the first moment they announce their pregnancy. It can be easy to get caught up in the idea that you need to buy everything. However, many baby items are used only a few times, and aren’t really necessary. The thing is, sleep is important. You can’t grow a healthy baby unless you are getting a healthy night of restful sleep. Any pregnant woman who is having trouble sleeping should check out the options when it comes to pregnancy pillows. Remember, you will use it for 9 months of sleep! In fact, you may be so comfortable that you continue to sleep with your c-shaped pillow long after the baby is born. Overall, anyone can benefit from the luxurious relaxation that a c-shaped pregnancy pillow is sure to provide.